Business hotel, 1 min from subway station! Bupyeong Tourist Hotel is a four-star hotel in 1 minute walking distance from Incheon subway line 1 Galsan station. The 6-story and 1 basement accommodation features diverse amenities including sauna, banquet hall and wedding hall. Located on a busy street, the hotel is also conveniently situated near numerous stores and restaurants. Bupyeong Market station and Bupyeong station at hand also offer fun shopping and dining experience! 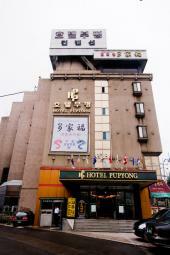 The elegant and modern appearance and economic prices make Bupyeong Tourist Hotel a popular accommodation. Reservation is not available for a while due to renovation construction. Date to start re-talking reservation will be announced when determined.